At G&C Asphalt, we provide road gravelling services for rural and municipal roads. We work with local rural municipalities to provide gravelling for regular spring maintenance and other general maintenance. We lay gravel on roads to bring levels back up to standard. Maintaining a reasonable level of gravel on unpaved roads corrects and prevents washboarding and pothole dips. We can begin laying gravel as soon as winter frost is thawed and the ground is dry. We provide gravelling services on an individual basis, or on continuing contracts. We can provide grading services as well, if required. We’ve built a reputation of consistent quality and reliability in our work. As a result, we’ve developed ongoing road gravelling contracts with several Saskatchewan rural municipalities. Our clients trust in the quality and timeliness of our work, and continue to choose our services year after year. For more information on our road gravelling services, please contact us. 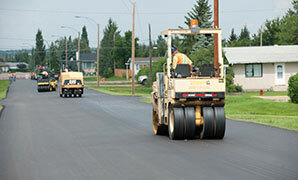 The Town of Battleford puts out a street repair program each year. It is a comprehensive program which involves grouping many small projects encompassing excavation, base, concrete and asphalt.